BlogHome » News » News » 60 Second Briefing: What is Planner? 60 Second Briefing: What is Planner? Does your team or project need organising? Planner is an simple app that can be used to create plans, build teams, assign tasks and clarify status updates on projects. This is done in a visual way where each plan initiates a new project board. 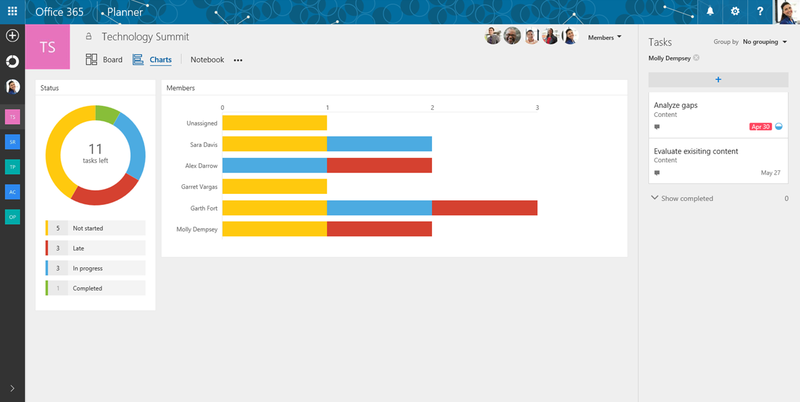 Tasks can be dragged and dropped into columns that can be categorised by team members, current status etc. The great thing about Planner is that it can be accessed anywhere across different devices and everyone can stay in the loop. This app is available to customers with Office 365 Enterprise E1–E5, Business Essentials, Business Premium and Education subscription plans. Working together without chaos is the main idea behind planner and features such as attaching files and links to tasks and even having conversations around them, ensure that projects run smoothly without the 749 emails flying around between the team. Every task discussion within the team stays on the plan, on one screen and does not get lost in other applications. Email notifications also make sure you never miss a thing when you are assigned a new task or added to a new conversation. New assignments or deliverables can be transferred straight from emails. In order to see where the team stands with projects, planner displays progress charts in visual dashboards to make sure goals are being reached. Overall, Planner is a great tool to incorporate into your projects that keeps everyone organised and on the same page – ultimately making life easier for everyone – who doesn’t love that? previous post: 60 Second Briefing: What is Office 365? next post: 60 Second Briefing: What is Yammer?